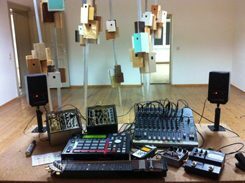 The celebrated musical and installation practices of Romanian-born, Berlin-based artist and curator Hanno Leichtmann bring him to Aotearoa this March as the Goethe Institut Artist-in-Residence. 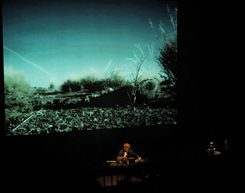 In past work, Leichtmann has drawn from a wide array of sound archives, treating them as sound-sets from which new works can be extracted. This approach has won Leichtmann praise in the field of minimal electronic music where his work as Static, and in groups such as Denseland (with David Moss and Hannes Strobl) and Groupshow (with Jan Jelinek and Andrew Pekler), is emblematic of a new wave of cerebral electronic music. Leichtmann’s most recent project is his duo with Valerio Tricoli, released on the influential Entr’acte label. Hanno Leichtmann: I've always liked working across different genres and contexts. I find it is inspiring to not work single-mindedly. Even my most conceptual work with sound archives varies a lot depending on the archival material I am working with, its historical significance and contemporary context, and so on. When did you first begin working in these various fields? And what drew you to them? Do you see yourself primarily as more of a musician / producer than you a gallery artist? I began as a drummer across various genres back in like 1999. Eventually, I developed into an electronic music producer. It began, actually, with a Roland TR-808 drum machine that I discovered in a cupboard of the jazz school where I studied. Nowadays, I am definitely an electronic music producer, and through that also a curator of festivals and events. Do you have a preference with respect to which area you work in – a favourite? I am a classic “studio guy”. I love being in the studio recording sounds to transform into an installation, radio piece, or techno record. I think installations are my favourite, though from time to time I also enjoy being on stage, performing in a concert-like situation. I especially enjoy doing this in other countries and am looking forward to the NZ experience! Leichtmann’s live version of his Minimal Studies album, created using an Akai MPC, selected modular devices, mixing desk, various effect boxes and an ebow tone generator made from a zither. | © Hanno Leichtmann How does a musical event where you perform to an audience from a stage differ to presenting work in a gallery context? With a live concert, it's all about the room and the audience, whereas in a gallery most of the time there is a “white cube situation”, which is much more neutral, though is sometimes somehow annoying. But most of the time I like it. Also, the audience for an installation is different. They are often much more abstract in their thinking, I would say, not the narrow kind of thinking professional musicians sometimes have. Hanno Leichtmann performing “Christoph Schlingensief´s African Twintowers (Re)Played” at the 2016 CTM Festival for Adventurous Music and Art | © Udo Siegfried How do you expect the context of the Goethe Institut (Wellington) will bear on the work you do during your residency? The Goethe Institut were so nice to offer to organise several concerts, including one with you in Auckland at the Audio Foundation which is great! In the best case, I will also find an archive of interesting NZ sounds to work with. I will have access to a private studio while I am in Wellington, where I can continue preparing my current installation for Haus der Kulturen der Welt [House of World Cultures] in Berlin on the topic of 100 Years of Beat. Your installation works have often revolved around specific sound archives. Could you discuss your method? I am very happy to have found a method to transform pre-recorded sounds from a special context, for example Roedelius, Ferienkurse Neue Musik, Primitiva, into new sounds and works. The original context of course gives the work a thematic frame as well as a unique sonic aesthetic. What are your thoughts in relation to a more abstract notion of ‘the archive’? Do you consider them to be fixed, static, or as things which change over time? I think archives are fixed in time by virtue of their content remaining constant, however, the reception of that content is open to change over the course of time. Is the appeal of sound archives material or conceptual? I think it’s interesting to work with a limited pool of sounds and to go deep into the details. For me it is not so much about the history of the material, but much more about confronting myself with a certain theme, language, or selection of sounds, and then working out how best to assemble/arrange them. Hanno Leichtmann, Nouvelles Aventures (9 min excerpt), created for the 70th anniversary of the Darmstadt International Summer Course and its “Historage” project, using the full archive of the Course as source materials. How would you describe your approach to your personal archive (whether this be your label, or a personal collection of found or recorded sounds)? It's like with my instruments. I buy a lot and try a lot of instruments, and I frequently end up selling the new ones after 4 weeks. Only the best instruments/records/sounds “survive” and stay with me. SY – 4, a four-channel sound-installation using sounds generated with an original SY-1 by Pearl, an early drum synthesizer. | © Hanno Leichtmann Is there a certain type of sound or archive that you have a special interest in working with? No, I like all kinds of archives. At the moment I am working on an installation and radio piece made only from sounds of drummers who have inspired me. It is the most challenging work so far because the sounds of individual drum strokes are very similar, whether they be imparted by the jazz-legend Elvin Jones or avant-metal player, Dave Lombardo. Best of luck! Looking forward to meeting you in the coming weeks and seeing how your work progresses during your stay in Wellington. Sam Longmore is an artist, electronic-musician and writer based in Auckland, New Zealand. His work is informed by the relationship between geography and architecture, soundscape and acoustics, sculpture and installation. He holds an MFA (1st hons) from the Elam School of Fine Arts and has exhibited at galleries and project spaces in Aotearoa and abroad. Longmore has contributed writing to several institutions and journals, notably a piece for Artspace about Julian Priest’s 2014 Chartwell Stairwell commission, La Scala. Currently, Sam is on the external editorial board for the Writing Around Sound Sonic Arts Journal, and works at Auckland's Audio Foundation.